We’re delighted to have received a Bronze Award in this year’s Junior Design Award for our Deluxe Travel Centre/Cot. This category was an interesting one. All the judges discovered clever products that are not only nice to look at but practical for parents to use, useful and sure to make family travel a whole lot easier. The NSA Travel Centre certainly fits the bill! It’s a product that is very practical and guaranteed to make family travel a whole lot more hassle-free. The Travel Essential Deluxe Travel Centre and cot is 3 products in one. 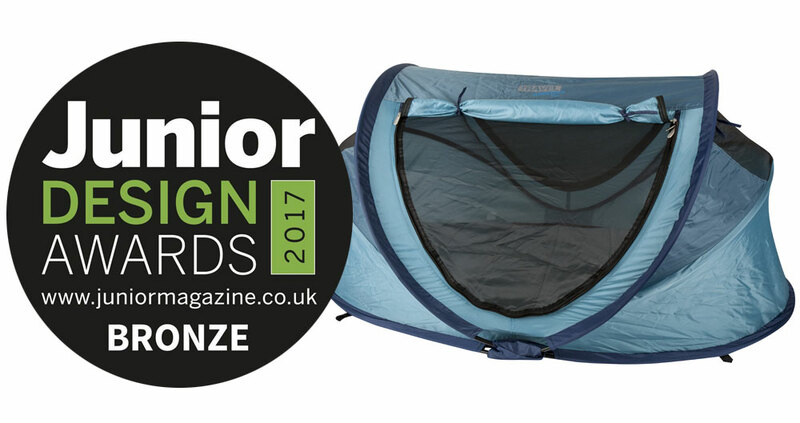 A tent to take to the park, the beach or just have fun in the back garden; a tried and tested UPF 35+sun shelter, and a travel cot for safe comfortable and restful sleep anywhere, anytime with a quilted sleep mat and self-inflating mattress. The superb design is compact and portable making it quick and easy to pop up and fold down, it comes with tent pegs for outdoor use and a carry case. Ideal from 0-4 years. Find out more here. It’s an award winner! Congratulations! Well deserved – it’s a super product.